If you have a sweet tooth, you may have read studies talking about the health benefits associated with eating moderate amounts of chocolate. But our research has found a potential health risk in popular chocolate products that’s been flying under the radar – many chocolates contain toxic metals like lead and cadmium. No level of lead is safe for children. Lead exposure has been a significant public health issue for decades. Lead is linked to a variety of neurological impairments, including learning disabilities, seizures, and a lower IQ. Developing fetuses and children are especially vulnerable to lead exposure because their brains are in critical growth and development stages. Cadmium is also known to cause reproductive harm. Cadmium can cause damage to the kidney, liver, and bones, while also impairing neurobehavioral development. Children are more susceptible than adults to exposure from low doses of cadmium over time. As You Sow has conducted independent laboratory testing of over 120 chocolate products for lead and cadmium. Based on the results of our testing, which found 96 of the 127 chocolate products tested contain lead and/or cadmium above California’s MADLs, we filed legal notices with over 20 companies, including Trader Joe’s, Hershey’s, Mondelēz, Lindt, Whole Foods, Kroger, Godiva, See’s Candies, Mars, Theo Chocolate, Equal Exchange, Ghirardelli, and Chocolove, for failing to warn consumers that their chocolate products contain cadmium or lead, or both. In 2018, our legal efforts culminated in a first-of-its-kind settlement with the world’s largest chocolate companies. In partnership with As You Sow, 31 chocolate companies, including Cargill, Hershey, Mars, and Nestle, have committed to funding an independent expert committee to investigate the sources of lead and cadmium in chocolate, find feasible measures to lower levels of these metals, and evaluate and recommend the lead and cadmium concentration levels in chocolate that trigger Proposition 65 warnings. Meanwhile, consumers can help make a difference by making companies aware that you take this issue seriously. If your favorite chocolate brand contains lead or cadmium, call, tweet, or otherwise ask the company to remove or reduce the heavy metals from their products. Since 2014, As You Sow has commissioned independent state-certified laboratories to measure levels of lead and cadmium in over 120 chocolate products available at retailers across California. The table below shows the amount of lead and/or cadmium found in each sampled chocolate product, measured in micrograms per serving (ug/serving). See our FAQ for more information on how we test these products. Search, filter and sort the table by clicking on the triangles in any of the column headings. Can’t find a particular chocolate? 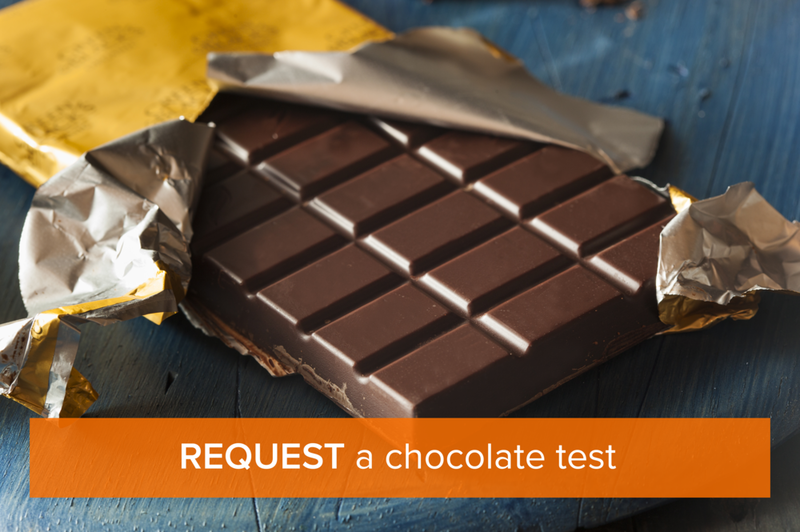 Put your chocolate on our list and consider making a donation to our chocolate testing fund. "ppm" refers to parts per million, the concentrations of lead and/or cadmium tested in a chocolate product found in a single lab test. "ug/serving" refers to micrograms per serving, the amount of lead and/or cadmium in a single serving, calculated based on the serving size on the product label.